Last year was great for Nokia as the company made a comeback into the Android market, launched several phones in almost every price range and the phones were appreciated by the users. Nokia started 2018 by launching the 2nd Gen Nokia 6 with upgraded design and specifications. It comes with a Snapdragon 630 processor which is a big upgrade compared to the Snapdragon 430 of Nokia 6 (2017). However, launching Nokia 6 (2018) with Snapdragon 630 raised some questions since there is already Nokia 7 with the same chipset. Today, the Nokia 7 Plus was spotted on Geekbench that revealed it is coming with the most powerful mid-range processor right now, the Snapdragon 660. As per the listing on Geekbench, the Nokia 7 Plus runs on Android 8.0.0 Oreo out of the box and is powered by an octa-core Snapdragon 660 processor along with 4GB RAM. The Snapdragon 660 processor, as we all know, can perform on par with the Snapdragon 820, which was the flagship processor from Qualcomm for 2016. 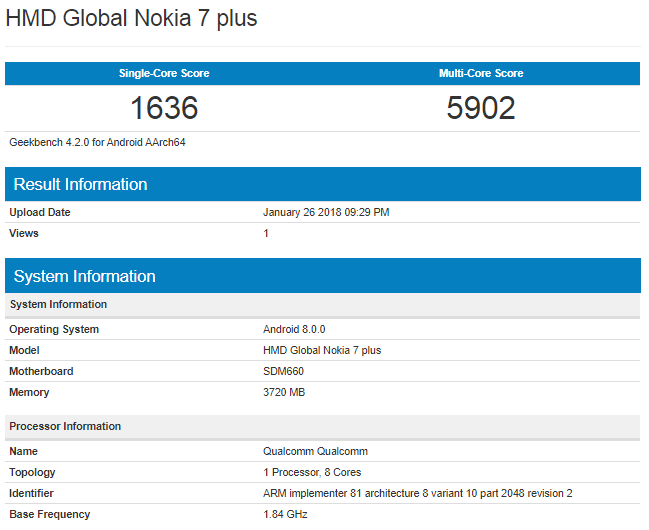 Talking about the benchmark scores of the Nokia 7 Plus on Geekbench, it scores 1,636 on the single core while 5,902 on multi-core. We have no details of the other specifications so make sure that you have allowed notifications from DroidHolic on your browser so that you never miss any new update. Stay Tuned.